The memorial is comprised of a rectangular bronze plaque attached to a roughhewn granite block on a single roughhewn base. In relief inside an oval that encompasses one third of the plaque is a representation of General Robert E. Lee astride his horse Traveller. The inscription, also in relief, appears below the oval. The Asheville marker was the first of at least six with this plaque placed in North Carolina. Plaque: United Daughters of the Confederacy, North Carolina Division. Granite block: Provided by the family of Colonel John Connally. Mrs. James Madison Gudger, Jr., chair of the Dixie Highway Committee for the U.D.C. in North Carolina, unveiled the marker. During comments, Mrs. Gudger spoke of the “far reaching results” achieved in honoring the “memory of the South’s greatest hero, Robert E. Lee” and that the plaques will speak a “silent message through all the coming years.” She further said the markers will help “keep alive Southern traditions, and perpetuate…the true history of the Southland. At the completion of this dedication Mrs. Gudger and others traveled to Fletcher to dedicate an identical marker placed at Calvary Episcopal Church. An address on Robert E. Lee was given by Lucian Lamar Knight, state historian of Georgia at both dedications. 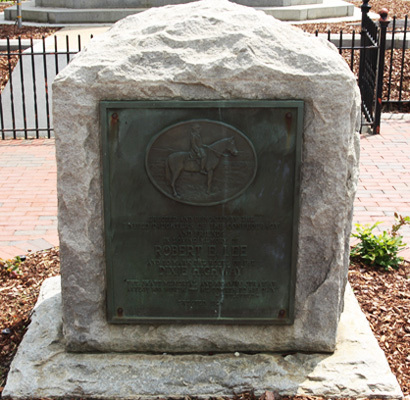 The marker is near the center of Pack Square Park right in front of the Zebulon Vance Monument. Several hundred yards east in the immediate area of the old Buncombe County Courthouse there are other notable plaques, monuments and memorials: Western North Carolina Veterans Memorial, 60th NC Regiment, Revolutionary War, Spanish American and other wars, Police and Firemen who died in the line of duty, Medal of Honor recipient Lt. Colonel Robert Morgan and former Governor Samuel Ashe for whom Asheville was named. The marker is in the center of the downtown square, surrounded by beds containing seasonal plantings.